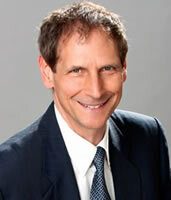 She retained my services to determine whether alterations are on the birth certificate or whether the person made an error writing the birth certificate. She asked me to determine the original writing if alterations were on the birth certificate. I suggested she contact the appropriate government office to obtain a certified duplicate the birth certificate. She informed me no such records are maintained by the government in her home country. She sent the original birth certificate to me for examination. The first step in my examination was a visual inspection of the birth certificate. Two locations on the birth certificate had obvious alterations. The first alteration was on the first line of the birth certificate. The birth certificate has a handwritten volume number on the first line. The volume number is the volume in the government's records in which the birth is recorded. The second apparent alteration was in the year of birth. This is also a handwritten number. 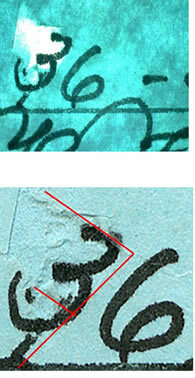 Markings showing the paper had been damaged below the number 8. A number eight of nine was written over another number. The bottom of the original number protruded below the base of the nine or eight. The number nine appeared to have been changed to an eight. The day and month of birth had no apparent alterations. I scanned the front and back of the birth certificate at 1200 pixels per inch (ppi) in color. Although this creates a very large file, the advantage is the image can be enlarged in Photoshop with much detail. The apparent alterations were imaged using a digital microscope. The digital microscope captures images directly into the computer where they can be examined. The areas with alterations were imaged using infrared light. The digital microscope can perform infrared examinations. Infrared light is used to distinguish writing inks. 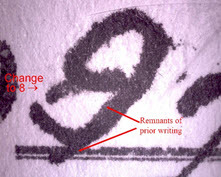 The reason for using infrared is to determine whether different pens may have been used for the original writing and an alteration of the writing. I wanted to determine whether the year 1984 was originally 1994 or some other year. I placed the document onto a light table to examine it using backlighting. This examination was very beneficial for determining how and alteration may have been executed. The paper document was retired into a file folder where it is protected from potential damage. The backlit areas of the apparent alterations revealed excess light coming through the thick blue paper on which the birth certificate was printed. The paper under the top portion of the number three in the volume number had been removed. The number three was then written into the volume number. This changed the original number to number 36. Remnants of the original number are visible below the three. I examined the three using a digital microscope at 40 times magnification. The remnants and scrapings gave the impression that either 46 or 76 was written where the number 36 now appears. I placed a red European-style seven over the three. It is shifted slightly right from the remnants of the original number. Although not shown here I placed the number three in 36 directly over another number three handwritten on the birth certificate. The two number threes did not match. Also, the numbers written on the remainder o the birth certificate were placed either on the writing line or directly above it. In this instance the number three is elevated above the line. That is another indication of alteration of the document. Backlighting revealed the paper below the number nine or eight in the year had been scraped to remove an original number. 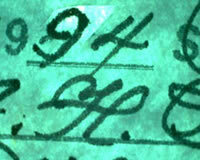 Remnants of the original number are visible below the writing. The disturbance to the paper gave an impression a number seven may have been written where the nine appears. The young lady was born in 1994. A hypothesis of this observation is the initial alteration may have been writing in a seven to make the year 1974. The person making the alteration may have realized that was not a good year based upon the age of the person to be using this birth certificate. The seven may have been scraped off and the nine placed back onto the page. The nine was changed into an eight using a different pen. This image was taken at 40 times magnification using a digital microscope with infrared light at 760 nm. The remnants of the original writing is visible. The line going from the tip of the nine up into the loop of the nine was written to create the bottom portion of the number eight. Comparison of the nine with other number nines on the birth certificate show that the nine in the year was written by a different person then the person who wrote the other number nines. The other writing was made with more flourishes than the number in the year. The birth certificate had been altered at least once, and probably twice. The method of alteration was using a sharp instrument to scrape off the top layer of paper which contained the numbers the person wanted to change. A black marker pen was used to write in the new numbers. I never learned from the client the result of this examination.